Not even illness or inclement weather can stop the fifth-ranked women’s tennis team. Miami (18-3, 7-1) took both of its weekend matches in Virginia in indoor matches, beating No. 54 Virginia Tech (10-8, 1-6) and No. 22 Virginia (10-6, 3-4) by scores of 6-1 and extending its winning streak to seven. 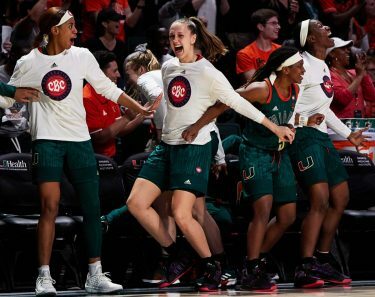 Besides being atop the ACC standings, ahead of teams like sixth-ranked Georgia Tech and seventh-ranked Duke, six of the last seven victories for the Hurricanes have been against top 25 opponents. Part of the reason for their success has been the emergence of solid doubles teams. UM is a perfect 13-0 when collecting the doubles point, and the Canes have taken the crucial first point in their last six matches. “Our [No.] 1 and [No.] 2 doubles are proving they can play with just about anyone in the country,” head coach Paige Yaroshuk-Tews said. Sixth-ranked Julia Cohen won her 12th straight match and seventh straight-set victory in a row, while No. 24 Laura Vallverdu, in the second slot, upped her streak to three. 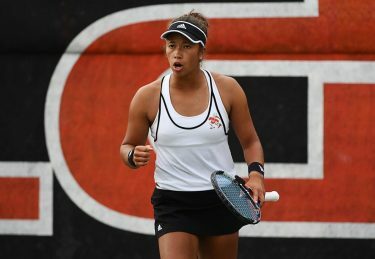 Two of her last three wins have come against nationally-ranked players. With two more singles players in the top 50 – sophomores Bianca Eichkorn (No. 40) and Michaela Kissell (No. 50) – both of whom took care of business, it’s hard for teams to match up with Miami. The former doubles partners each hold seven-game winning streaks. “The girls came out in singles and got on top early, and held the lead,” Yaroshuk-Tews said. The Hurricanes return to the Neil Schiff Tennis Center to take on N.C. State (4-13, 1-6) Friday at noon and No. 34 Wake Forest (12-6, 3-3) Sunday at noon.